What would you do if ants started crawling out of your camera? Brushing ants off of my Sony A7ii. I had a lunch booked with my friend in 30 minutes, and I am gathering my things to run out the door. My camera goes with me almost everywhere, and today is no different, so I grab it from the shelf and plug in the charging cable to give it a little top-up charge. Even though it's nearly midday, the light in my apartment in Chiang Mai (Thailand) is dim. The blinds are covering most of the windows to keep the sun from heating the place up and making me turn on my arch nemesis, the A/C. It's only a couple of minutes later that I pull the charging cable from my camera as I head out the door, when I notice a little something on my hand. It's hard to see in the light, but I can see a couple of black things on my hand... And they're moving? I head to the bathroom for some bright light. It's tiny ants on my hand, and when I brush the side of my camera, ants suddenly appear all over my sink like a bad magic trick. The first thing I think, is "What is going on?" followed by "How did they get in here?" But then the most important and time sensitive thing comes into focus: How do I get them out? Seeing ants in your home is not all that out of the ordinary in Southeast Asia. It's not uncommon to see a line of ants running alongside a building or even a bathroom wall, but generally if you keep things clean and don't leave food out, they aren't a bother. So I check the shelf that my camera sits on, frantically moving around the other lenses and batteries to see every corner, but I only spot one or two ants. Hmm. Unsure what to do, I wrap up my camera in a plastic bag, and seal it tight with an elastic band. Running out the door, I feel like I'm rushing my camera to the ER, and that every moment counts. My baby is in trouble! When I pull my motorbike up to the best camera shop in Chiang Mai, they have absolutely no interest in opening up my camera to get the ants out. I suspect is because they're afraid of it not working when they put it all back together. Now I'm on my own to find out. How Does One Rid Their Camera of Ants? Back at the apartment, I brainstorm. I could use an ant trap, but most of those work by having poison in food that is brought back to the nest. It would kill the ants, but leave my camera full of dead bodies. I could wait for them to leave, but how do I make sure they don't return, and have them travel throughout my apartment? So I come up with a plan. I put my camera in a white bowl, for maximum contrast when the ants come out. Then I take a dinner plate, and put some soapy water on it. I place the plate in my bathroom sink and put the bowl with camera on top. My thought, or at least hope, is that the ants will come out of the camera at their leisure, likely looking for food. If they try to venture too far, they'll end up over the bowl and into the soapy water where they will drown. I have no idea if it'll work, and I would have been happy if you would have shared any of your ideas at the time. A few hours later I have a look, and there are a few dozen of these micro ants in the bowl, and a few who have drowned in the soapy lagoon below. No one made it to the sink, so I clean them out and leave it over night to continue to work itself out. In the meantime, I've been doing some research. Not only do I want to solve this problem, but I want to prevent it from happening in the future, which I think is perfectly reasonable. I had heard that ants are attracted to electrical current, and that might be why they have decided to take up home in my most treasured of electronics. It turns out that’s not the case, and what they like is small dark places. The insides of electronics just happen to be a perfect match. I also read that there is a queen ant in these colonies, and I have been watching like a hawk to see when she decides to leave. So far, nothing. Over the next week, I check a couple of times a day. By now, hundreds and hundreds of ants have left my camera, and none have made it past the soapy water and into the apartment. I’m confident that it's working. I am also noticing that during those first few days, the ants were quite feisty and moved around faster. Now a week later, they're much slower. My guess is that food is running out and the weak ones are left. Shortly afterward, I see a much bigger ant than the rest. It must be the queen! I quickly send her off on a water slide funeral. Over the next few days, fewer and fewer ants are coming out until after 10 days or so, there are no more coming out of the ports or battery compartment. Mission accomplished. The big queen ant at the top, compared to the little ones bottom-right. But how did the ants get in my camera? 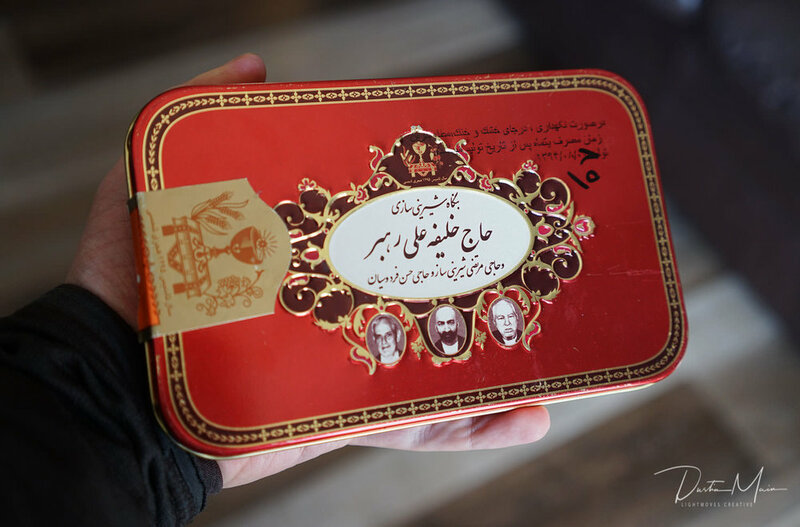 The Iranian sweets container which brought the ants initially. It puzzled me for days. With no other ants around, the trail of clues went dry. That was until I looked in a tin of sweets I had picked up a few months earlier in Iran. This Pashmak, which is like a cousin of cotton candy, was to be a gift for friends in Myanmar a month earlier. When I didn't manage to cross paths with them, it had continued on with me. Opening it up, I noticed it wasn't sealed in plastic, and hundreds of ants had been long dead inside. Oops, this much have been the initial culprit that attracted them. Years later, I took my camera in for a routine sensor and general cleaning. Remembering the story, I ask Garrett from Paramount Camera Repair if he had noticed any ant bodies in there. He mentions that it had looked a little dirtier than normal behind the back panel, but he'd take it apart and see. 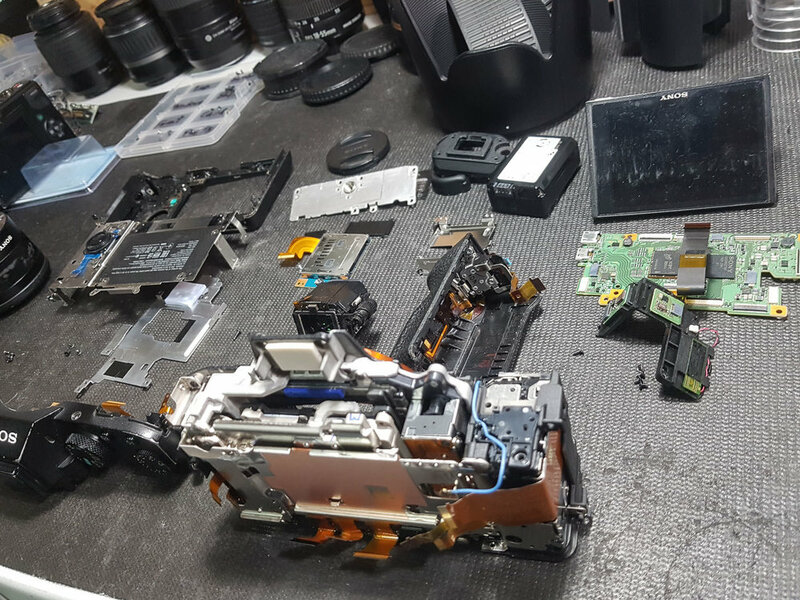 My Sony A7ii camera body, exploded. With the camera in about as many pieces as it can possibly be, it's clear that there are ant bodies everywhere. Some places, like in the interior of the grip, they've been baked onto the sides of the camera over the past 3 years as I went from locations and climates around the world with temperatures ranging from a humid +40°c to a bone-dry -45°c. They needed to be literally scraped out. And now... It's as good as new. Eviction complete.